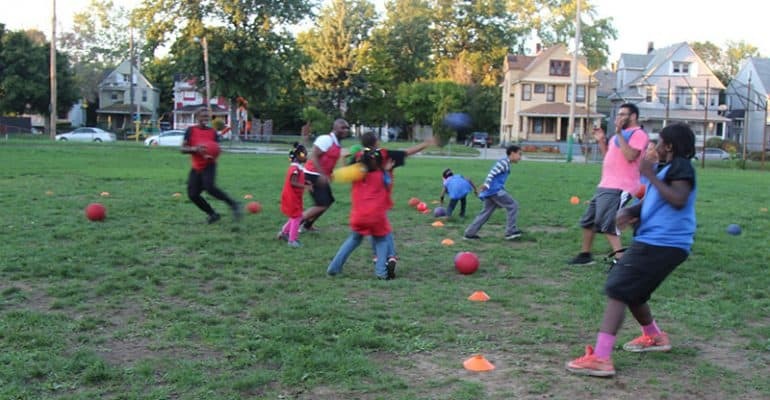 Kickball is played similarly to baseball and has been a playground favorite since the early 1900s. If you can kick, catch and throw a ball, you’re ready to play! The field of play is set up like a baseball diamond with 4 side bases and a “pitcher’s mound”. We recommend at least 7 players on each team to cover a whole field. Players are set at each base plus two in the outfield and the pitcher. The pitcher rolls the ball underhanded to the player who is up at home plate. That player’s job is to kick it within the field of play but away from the opposing team’s players and then make a run for first base. As each player kicks the ball, player’s on base take off and run to the next base until all four bases have been passed and runs are scored. The opposing team chases the ball after its been kicked. If ot is caught in the air, the kicking player is out. Once the ball is caught, it is the fielding team’s job to throw the ball at opposing team players as they pass each base. When the ball hits a runner, they are out. When a team reaches three outs, they switch sides. The team that has scored the most runs after 9 switches is the winner of the game.